Now you’ve decided to make a check on your bucket list and you’re ready to dedicate yourself to this magnificent sport! Well here it goes! Follow these guidelines and you’ll be cruisin’ within 20 days or less! First Days – Your first days should be on a borrowed or rented surfboard. After all you don’t want to go spending a bunch of money on a sport that you may not be head over heels for. Before making an investment in a surfboard, try it out. Get that feeling inside that nothing is going to stop you from learning this sport. Part of your surfing journey will be finding friends that are passionate about surfing, so if you have begun to put your surf dreams out into the world, there has surely already been a friend to offer up their extra surfboard and they have probably already offered you some tips for starting out. Take advantage of their offer because this is a real offer! One thing I have learned about surfers is that they love to share the beauty of the ocean and the experiences that come with this rad sport. Avid surfers tend to have a quiver- a collection of surfboards, and are always looking for cool people to ride with. If you haven’t been offered to borrow a board yet, put your surfing aspirations out there and most likely you will get an offer soon. If you don’t live near the ocean or haven’t made surfing friends YET, then there is always the option to rent a surfboard when you first start out. Most surf shops rent out a wide range of boards for a nominal hourly or daily fee. This option also gets you working towards taking my next piece of advice. Hangout at your local surf shop. Hanging out at your local surf shop is a great way to get to know surf culture and it just feels so cool. Depending on the shop and the season, you’ll be able to talk with the clerks and shop owners for hours. They’ll tell you things like where to surf, what sunscreen you need, thickness of wetsuit to get, and how to wax your board. They are all surfers and know this sport, so it definitely won’t hurt to hang around. Surfers love to talk surf! The best surf shops to hang at are the ones where you don’t feel any pressure to buy. They know that eventually you will buy, if you feel comfortable. And even if you don’t buy anything that day, they’ll still love to talk surf with you! Foamie – In your very first days of poking around, more than likely you will have someone tell you that the best thing to do is to make a small investment in a foam surfboard. This is exactly what you should do. With very little capital you can get your first board and this is the best way to go. Not only are foam boards economical, but they float really well, and floating is just what a beginner needs when first starting out. Foam boards are thick and have a larger surface area to stand on, which makes it easier for newbies to learn how to pop up when on a wave. The nice thing about these boards is that you can get them at your local surf shops, big box stores, or online. Even if you graduate off this board in just a few weeks, you will want to keep it for your own quiver, so that you can start inviting friends to join you surfing too. Dry Run – Before plunging in the ocean, practice on the beach. Find an open spot where you can lay out your board and have a space to stretch. Make sure your body is feeling nimble enough to do the first part of a burpee, because essentially that is the motion you will be doing over and over again. You may have noticed that many surfers like to do some form of yoga before they head out to the waves, this is because they are trying to get their body loose in order to be more proficient in their surfing practice. Do yoga or stretching before going in the water. You will also want to practice popping up on your surfboard on dry land. To do this you need to dig a hole in the sand big enough to fit the fins of your board. You want your board to lay flat on the sand but your fins should not carve into the sand because they will sit in the hole you just dug for them. The hole is made so your fins stay safe from cracking or breaking. Next, lie down flat on your board, belly down, as if you were out in the ocean. Practice pressing your body up by grabbing the sides of the board (the surfboard rails) with your hands, then straighten your arms and hop to your feet. Your front foot should be stepping no further than three quarters up to the front of your board. This is a good place to start your front foot, but as you start riding waves, you will get a feel for the best place for your feet to be based on the waves coming in that day. You will naturally notice your footedness when you stand up on your board. Footedness is your natural preference to have your right or left foot forward. Most people start with their left foot forward, this is known as regular stance. People that start with their right foot forward are known to have what is called a goofy stance. Either type of stance is acceptable, it’s just what naturally comes to you. Practice popping up on dry land until you feel you are ready to give the water a go. About 5 to 10 times should do it. White Water – Start off standing up on your board and riding in the white water. White water is the wave after it has closed out or crashed. It’s easy to spot the white water and know where to be because the water is white and the wave has calmed significantly. White water is generally easy to stand up in by standing on the ocean floor. You will want to paddle out or walk out just to where these white water waves keep coming in. This allows you to get lots of reps at attempting to stand up in a short amount of time. The water is slow but will push you just enough so you can start to ride on your board. This is where you will learn to stand up on your board. You will learn what it feels like to be pushed by a wave. Standing Up On Your Surfboard – Okay so once you master standing up on your board, you will be on your way to paddling beyond the white water. The best thing to do while learning to ride in in the white water is to stand next to your board, face your body and board toward the beach and look back at the waves. When you see a wave coming, hop up on your board, belly down, and start paddling. When the wave starts to push you, grasp the sides of your board and push up with your arms, just like you are doing a push up. Get your feet under you, stay low, bend your knees and ride the wave. Easy right! Take your time with this process. Let the wave push you until you feel speed. Make sure you are stable enough to stand up and then try it. If you must go to a knee first, do it, then slowly stand up. Repetition with this process is the ticket to success. The more you stand up, the more your confidence will build. Then you will start paddling beyond the white water. It will happen naturally for you to want to go beyond the white water, or eventually, someone will tell you to grow some cajones and paddle out to real waves! Sitting on your board – Now you can stand up and you are out past the white water, what are you supposed to do now? Well, wait. What are you waiting for? Waves. Sometimes they will come fast, sometimes slow, sometimes in grouped sets, and sometimes solo. I recommend watching the waves until you get a feel for how they are coming in that day. Every day will be different. As you wait for waves you will want to learn how to sit on your board so you are facing out at the ocean and your body is upright as if you are riding a horse. Not only does this save your neck and back from being strained, this is how you watch for the waves you want to catch. Sit on your board so the top of the board is in front of you. While you sit on your board waiting for waves you will want to practice turning around using the kick of your legs. You can kick your legs in a circular motion so that your board turns around and you face the beach. At first it’ll be like riding a buckin’ bronc but with lots of practice the skill to turn with your legs will come. When you finally see a wave that you want to catch, kick your legs and turn your board and body so that you face the beach. Lie down on your board, belly down, and paddle your arms, one at a time, just like you are doing freestyle swimming with a surfboard underneath you. Paddle hard and keep going until you feel the wave start to push you to pick up speed. When you are stable and ready, do your push up and hop up on your feet. Now cruise and enjoy the ride! Reading Waves – Deciding which waves to ride and which ones to let pass takes practice and patience. As you sit on your surfboard facing out towards the ocean you will look far into the horizon to watch for the waves. You may see a small bump far out in to the ocean that seems to be getting bigger. As it gets closer the wave’s crest begins to get darker. This is a sign that the wave could be rideable. The darkening crest means that the wave is gaining momentum and height. When you see a wave you can also notice which way the wave is breaking, left of right. By noticing the highest point of the wave, you can see which way the wave slopes down. You should ride the wave in the direction of this slope. Sometimes a wave will have a split peak which means it will have two slopes that are equal on each side as it breaks; in this case you can ride the wave in whichever direction you desire, left or right. You may also see a wave that breaks parallel to the sky all the way across, this is a closeout wave and will be almost impossible to ride so I wouldn’t try it. What you really want to watch for is where the peak of the wave is (the highest point) because this is where you want to be when you actually catch the wave. If this wave reading thing sounds confusing, well it is, and the best way to get context and experience with reading is to get out into the ocean and just start observing the waves and how other surfers choose their waves to catch. Once you feel like you understand how the waves are coming, you’ll be ready to take some too. Research – Before hitting the waves, do some research. Since you are already reading this guide it seems like you have this step down but it doesn’t hurt to do more. Research isn’t all about reading books or blogs. Get out in the field. 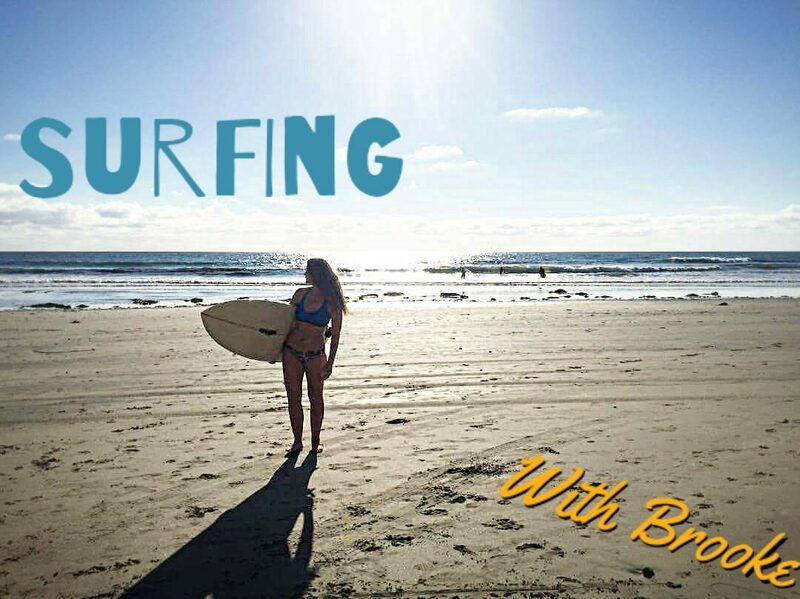 Some of the best research comes from talking with people about surfing, hence my focus early on in this post about hanging out at surf shops and making surf friends. Once you do begin to hit the waves, your research will continue and as you continue to deepen your understanding of the sport, your questions will become richer and more specific to your skill level. Your research will even continue as you float the ocean. Get out on your board and float with other surfers. Have a board meeting (float on your board in the ocean with friends), as they say. At your board meetings, ask simple questions to elicit simple advice. For example, ask an experienced surfer to show you how they maneuver their surfboard with their legs as they turn around. They will demonstrate for you and then you can practice right then and there during the board meeting. Get tips and tricks from those that look experienced and ask about surf etiquette. Generally, surfers with long hair and a long term sunburn, are most willing to shoot tips your way. They’ve been doing it for years and know the lay of the ocean. Talk with people about your experiences. Get to know local surfers and get their advice. Also, you should take some time to watch other surfers. 10 minutes spent on the beach observing what other surfers do, can give you insight into the waves that day or long term insight on technique. Don’t rush this journey, just savor it and enjoy it. The fruits of your persistence and patience will pay off.